Just how does his weight go up and down so hypnotically? The answer has just been revealed. In his latest memoirs, published in Argentina this week, Maradona confesses that during his “experimental” period at Napoli in the late 1980s he was bitten by a radioactive puffer fish that gave him special powers. He was sampling some sushi one night when he paid the restaurant owner to allow him to climb into one of the fishtanks in the establishment with three female companions. A puffer fish that was unknowingly contaminated with plutonium deposits bit the trickster on the ankle, and he fell gravely ill.
At the time it was merely thought that Maradona had overdosed on something whilst out partying, but he soon realised that he had a special talent: That he could blow his body up to twice its size to protect him from predators. He first used the gift in public in 1994 after failing a drugs test during the USA World Cup, and more recently he used it as a flotation device to get him to Cuba for a meeting with Fidel Castro. 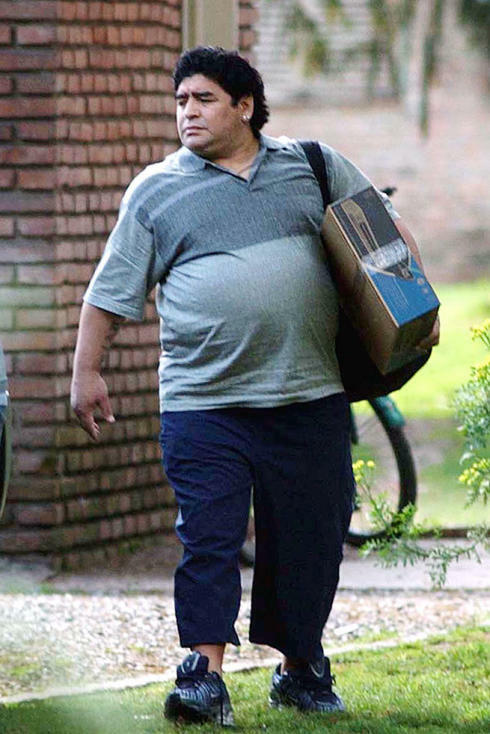 Doctors have issued a warning though: Do not eat Maradona’s liver or spleen, as it will cause death within 30 minutes after you have spouted a load of misguided philosophy into the face of the nearest buxom woman.